A cyclist in Istanbul, Turkey, uses a dedicated bike lane to get around the city. Photo by Benoit Colin/WRI. The diverse economic, social and physical benefits of bicycling are no secret, yet many cities are hesitant to better accommodate growing numbers of bicycles on their streets. 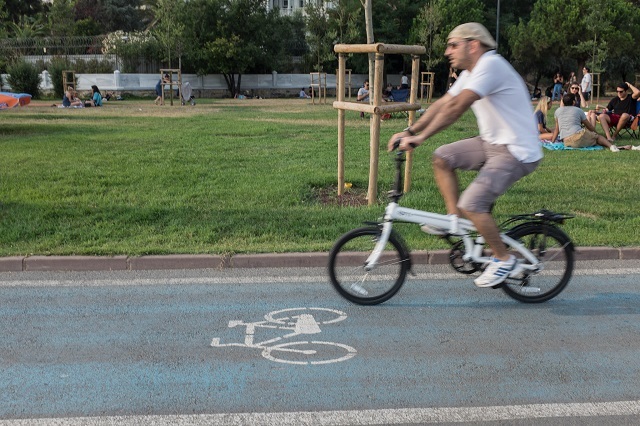 In October, WRI Turkey Sustainable Cities organized a workshop with representatives from 16 Turkish cities, the Ministry of Environment and Urbanization, and İlbank, a state-owned development bank, on what’s stopping cities from investing in robust and effective cycling infrastructure. By outlining barriers and their subsequent solutions, the workshop aimed to understand and tackle obstacles, helping cities meet the requirements of a new regulation from the Ministry of Environment and Urbanization. As of June 2019, it will be obligatory for cities to include bike lanes in their master plans. And by 2020, current bike lanes will need to be revised if they don’t already meet Turkey’s bike lane design standards, issued in 2015. Problem: Urban planners have the liberty of crafting innovative and creative cycling plans for their cities. But whether those plans are realistic, achievable, affordable or worthwhile in the eyes of implementation teams is always a question. Sometimes plans don’t have necessary detail, leaving construction crews to fill in the gaps according to their own vision. Other times implementation is outsourced, or the planning team is not familiar with the local context or best practices. Without planning and implementation going hand-in-hand, promises aren’t kept and projects aren’t completed. Solution: Both before a project passes from planner to implementer and after implementation begins, workshop participants recommended projects be audited. Audit units, like transportation commissions, can serve as intermediaries. Ideally members have technical backgrounds from different sectors to ensure the audit is thorough and multifaceted. The unit would conduct inspections and then provide feedback for corrections. Problem: Building new bike lanes, installing bike share systems and other big cycling projects have economic, safety, environmental and mobility implications, and can sometimes affect more than one municipality. Too often lack of coordination among different organizations leads to conflict or poor results. For instance, a Parks Department may build a bike lane through a green area without consulting the Transportation Department, leaving riders disconnected to any broader network. Various ministries in Turkey have developed incentives to promote cycling too, like free bikes, but because they are developed without consulting city administrations, they are rarely taken up in practice. Solution: Workshop participants suggested a novel idea: a bicycle transportation group at the province level that would include all relevant public bodies and NGOs under the leadership of the governor. This group would focus on design, standards, regulations and incentives, creating one body for coordination among many stakeholders. Problem: Bike infrastructure is often isolated apart from other modes of transport in Turkey. It’s not a surprise to come across a five-kilometer bike lane starting and ending in the middle of nowhere. Bikes won’t be a meaningful mode of urban transport if they don’t feed into the larger transport system. Solution: New bike projects should be seen as one piece in a city’s overall transport puzzle, whether through a master plan or other processes that lay out how a city is supposed to work. To achieve this, the mindset towards cycling needs to change. Cycling should be considered a major transport mode alongside metro or bus systems and designed with this in mind. Infrastructure should be planned to create an integrated network, emphasizing interchanges where users can switch from one mode to another to encourage first- and last-mile connectivity. Problem: In some cities where bike infrastructure does exist, many drivers and cyclists don’t abide by the rules of the road. Cars drive and park in the lane, blocking cycling traffic. Pedestrians too don’t notice the bike lanes and walk down the middle. Solution: Education programs on cycling rules and culture should be prepared for all ages across the country. Modules at schools, traffic education parks and driver’s license trainings should include a section on how road users should act towards cyclists in traffic and vice versa. A pilot program is already underway in some schools. As a result of the training program, a significant change is expected in the attitude towards the cyclists in the traffic, which will affect positively the attitude toward cycling as well. Signage can also be used around bike lanes to inform users, drivers and pedestrians about basic rules. Problem: New bike technologies like dockless systems and electric bikes are taking many cities by storm. But not in Turkey, where ministries have generally taken a more conservative approach, viewing these new technologies and the companies sprouting up around them as unstable, expensive and out of their realm of expertise. Solution: Despite its volatile nature, the new mobility revolution is here to stay. To stay ahead of the curve and meet the mobility needs of residents, it’s important for governments to learn to work with companies that act more like technology start-ups than traditional transport companies. Furthermore, legislation, standards and incentives should be flexible to accommodate change. Incentives provided for cities by the central government, for example, should not only focus on encouraging new physical infrastructure and bikes themselves but also encourage development of mobile apps and integrated ticketing, systems that can help people connect to many different services, even as they change. WRI Turkey Sustainable Cities presented the results of the workshop – both the challenges and solutions raised by participants – to the Ministry of Environment and Urbanization. As the new regulations take effect in Turkey, we hope these insights will help cities overcome common barriers and lead to safer, more useful bike networks across the country. Merve Akı is Urban Mobility Director at WRI Turkey Sustainable Cities. Hande Dönmez is Strategic Communications Coordinator at WRI Turkey Sustainable Cities.